Ufone is going to increase service charges of Uadvance service to Rupees 1 + Tax, said a notice printed in print media. New services charges will be applicable from February 21, 2012. Earlier, service charge for all levels of UAdvance is 50 paisas plus tax. If any customer takes all three level of UAdvance, they will have to pay cumulative service charge of Rs 1.5 plus tax upon return of all three levels. If any single level UAdvance is returned, customer will only be charged 50 paisas. UAdvance charges will be Re. 1 + tax from February 21, 2012. 1st Level UAdvance amount of Rs 10 is available to all Ufone subscribers. For any user whose account balance drops below Rs 5.98 can avail this option. All users who are active on the network for more than 180 days i.e. 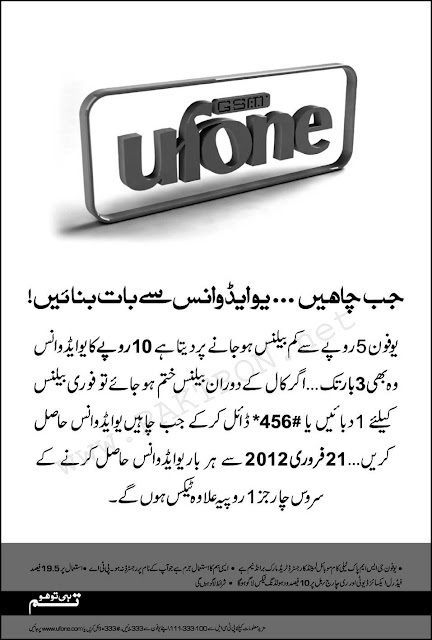 have used their Ufone number for outgoing calls or SMS, will be able to enjoy second level of UAdvance. That is, after availing Rs 10 UAdvance, users will again be able to avail second UAdvance of Rs 10 before recharging their account when their balance drops below Rs 5.98. All users who are active on the network for more than 360 days i.e. have used their Ufone number for outgoing calls or SMS, will now be able to enjoy third level of UAdvance. That is, after availing Rs 10 UAdvance each for 1st and 2nd Level, users will again be able to avail third UAdvance of Rs 10 before recharging their account when their balance drops below Rs 5.98. This facility is for Prepaid customers only. The advance balance amount will be deducted from the next recharge e.g. ULoad & Card Recharge. Only customers with a balance less than Rs.5.00 + tax can avail the UAdvance service. 19.5% FED on usage and 10% withholding tax at recharge or bill applies. Service Charge is Rs 1 + tax per refund.